All pictures contain additional information in the form of captions. Hold your cursor over the picture to display commentary. All photos available as prints or 5x7 note cards. The backbone of Discover! America's Great River Road is the amenities survey and accompanying maps produced by the Mississippi River Regional Planning Commission. The original survey collected details on all public river access points along the Great River Road, including boat ramps, fisherman parking, public hiking trails, and public parks. Each volume of DISCOVER! America's Great River Road updates that data and include private amenities of interest to the traveler... such as campgrounds, lodging, marinas, and seasonal attractions along the Mississippi River. For the first time since publication, Great River Publishing is making the contents of DISCOVER! 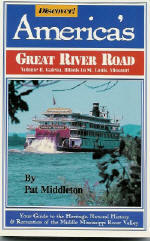 America's Great River Road available online. It is the sponsorship of our advertisers and your purchases of Great River Road guidebooks and products that makes this online publication possible. Please visit our sponsors when their offerings seem useful to you! Putting the contents of Discover! America's Great River Road online will take time, our hope and expectation is that you will be back many times to utilize this information! 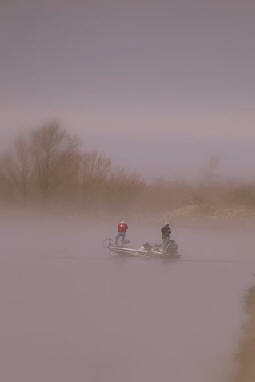 "Last year we traveled 5,000+ miles along both sides of the Mississippi River. It was a fabulous trip... in large part due to your DISCOVER! 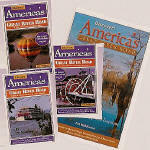 America's Great River Road guidebooks." Volume 1 Overview: Discover! America's Great River Road : St. Paul, Minnesota, to Galena, Illinois (The Upper Mississippi River) Click here for OVERVIEW. Detailed maps in each of the guidebooks are based on county road maps produced by the Department of Transportation in each of the ten states along the Mississippi River. Because the maps show quite well the less-traveled county and local roadways, these maps should also be useful to cyclists interested in getting off the major highways. The Great River Road is designated on maps and roadside markers by the green steamboat pilot's wheel. For the most part, you will find all state (STH) and county highways to be in excellent driving condition. In the event of high water, traveler caution must be the rule. The Great River Road Parkway is a program of highway improvement along both sides of the Mississippi River, from Lake Itasca to the Gulf of Mexico. Federally funded scenic easements, roadside parks, scenic overlooks, off-road parks and forests, points of historical interest, and other river-oriented facilities have been developed along both sides of the river. The route followed by the maps and commentary in Volume 1 commences at Prescott, Wisconsin, on STH 35. Volume 2 of Discover! America's Great River Road continues southward to St. Louis, Missouri. Volume 3 leads the traveler from St. Louis to Memphis, and Volume 4, from Memphis through the Mississippi River Delta to Venice, Louisiana, and the Gulf of Mexico. In Volume 5, the river buff explores the Headwaters, north of St. Paul to Lake Itasca. The route followed by the maps and commentary in Volume 1 commences at Prescott, Wisconsin, on STH 35 and continues south, following a number of state and county (CTH) to DeSoto, Wisconsin, where the traveler has the option of continuing on the Wisconsin side or crossing into Iowa on STH 82. The scenic Iowa route extends south through Harper's Ferry, the Effigy Mounds National Monument and into McGregor where it crosses the river again into Prairie du Chien, Wisconsin, and southward into the historic cities of Galenia, Illinois and Dubuque, Iowa. Volume 2 of Discover! 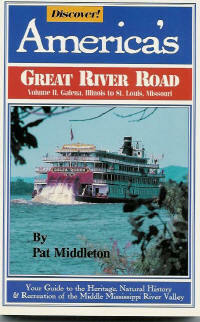 America's Great River Road continues southward to St. Louis, Missouri. Volume 3 leads the traveler from St. Louis to Memphis, and Volume 4, from Memphis through the Mississippi River Delta to Venice, Louisiana, and the Gulf of Mexico. Chapters two through eleven each feature on of the counties through which the Great River Road passes. 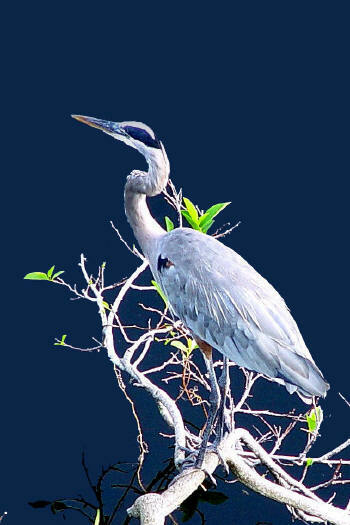 In most cases, there will be heritage, natural history and recreational highlights noted in the introductory overview of the county. The detailed information on each river access, historical marker, park and village is then consecutively numbered by county to correspond with the area maps included in the chapter (e.g. 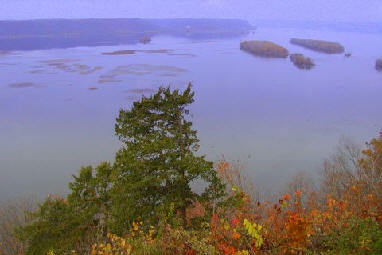 TE-3 Trempealeau Lakes). I have endeavored to provide information on Bed and Breakfast Inns, historical, cultural and natural history background on each of the villages, as well as sites of interest to the traveler. Some background topics are included in the Table of Contents under the heading of Special Features. I hope you will also enjoy the special "up close and personal" interviews labeled TRAVEL INSIGHTS which includes reflections from various persons whose lives are closely entwined with the river. There are several points of interest along the Minnesota shore that are easily accessible by river bridges from the Wisconsin side. 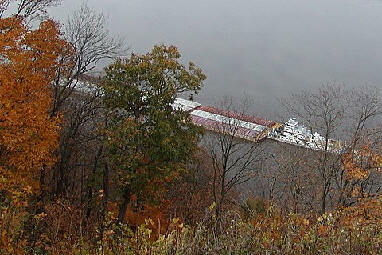 Red Wing, Wabasha, Winona, and La Crescent, Minnesota are included as side trips from the Wisconsin shore. 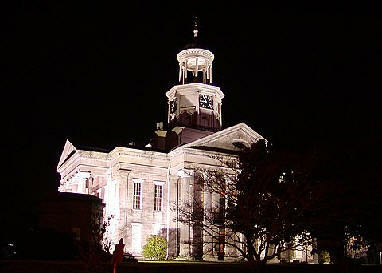 Similarly, Iowa river villages and towns are noted in detail for the traveler. Much has changed since the 1988 introduction of DISCOVER! America's Great River Road. River casinos continue to come and go (some in the dark of night!!). Most communities and families have long recovered from the Flood of 1993. What remains is a new national awareness fo the great asset we as a country hold in this nationally designated great river road parkway. Tourism in the valley is at an all time high... yet barely budding. We have much to be proud of in our Midwestern heritage... old world values, work ethic, and hospitality to travelers along the river. The beauty of the Great River Road lies in traveling slowly; stopping to absorb the view, visiting a fish market, chatting with locals at the cafe. 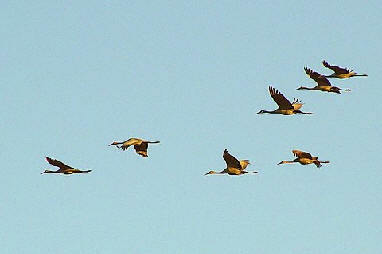 It is our Rhine River, an Everglades of the north, with a national treasure of eagles, wildlife, and migrating waterfowl. It is "Little Italy," Norwegian spoken in the street, and elegant paddlewheelers. It is my hope that the DISCOVER! America's Great River Road guidebooks will cause you to pause for a moment to enjoy an area bounded by, nurtured by, and challenged by a great river. For in the end, we are all travelers. Only the bluffs and the river are here to stay.